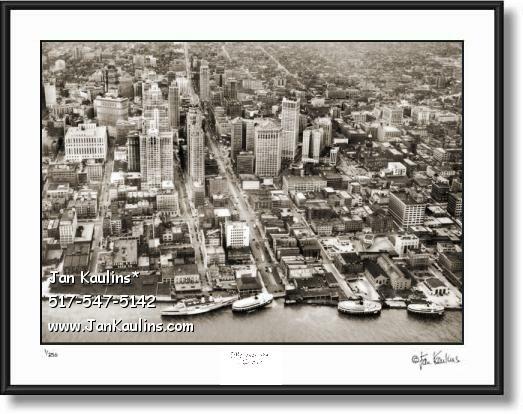 OLD DETROIT aerial picture photo photograph - Old historic vintage Detroit photo picture print photography for sale. This sepia toned old black and white Detroit skyline aerial picture photo photograph print is a rare and excellent aerial Detroit photo image ca. 1930-1940 that has been professionally restored. sepia toned and printed by artist Jan Kaulins. In it we can see three riverboats, including the two Bob-Lo Boats docked at the foot of Woodward Ave., and next to them, on The Detroit River, we also see a luxury liner docked at The Port of Detroit. Behind the Bob Lo boat dock can be seen the original Vernors Ginger Ale factory and the large Vernors sign above the factory. The original of this black and white Detroit aerial photo was taken many years before the Detroit riverfront, showing mostly large warehouses in this photo, added the Renaissance Center, Cobo Hall and other contemporary architectural landmarks. In the middle of this old historic Detroit photo can be seen the old J L Hudson's Building, which at this time was in its bustling prime, located centrally on Woodward Ave. in downtown Detroit. This Detroit photo is a historical sepia toned unique and rare early Detroit aerial photo made from the original black and white photo by The Detroit Photo Art Gallery. TO SEE THE MANY OTHER HISTORIC AND CONTEMPORARY DETROIT PHOTOGRAPHS OFFERED BY THE DETROIT PHOTO ART GALLERY, PLEASE CLICK ON THE BOX LINK BELOW THIS PARAGRAPH THAT READS: "HOME - Return to All Galleries."